Don't Tell Me What You Think I Want to Hear, Tell Me What I Need to Know! Have you ever been placed in a situation where someone protected you from a painful truth, but in so doing left you at a disadvantage because you couldn't make a fully-informed decision? A common complaint I hear from in-house counsel is that outside counsel often don't share small problems, and some of these grow into big problems. This applies whether it's a budget overrun or a curve ball in the legal matter they're addressing. 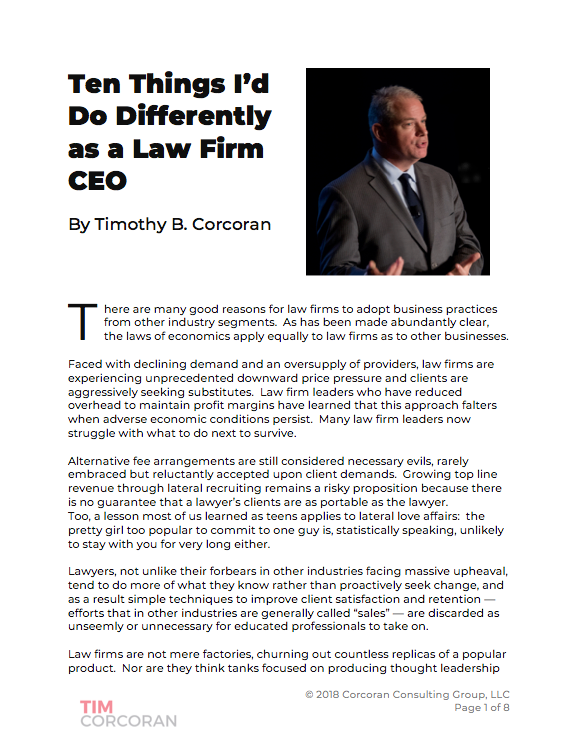 I've written previously about the critical need for in-house counsel to budget accurately for legal matters -- matters that from the perspective of corporate chieftains are no less variable or uncertain than global supply chain costs or revenue projections. At a recent discussion on the topic, a Chief Legal Officer explained the impact of a cost overrun in her legal department. As a big box retailer with profit margins in the mid-single digits, there is very little excess spending in the organization from which they can divert funds to address cost overruns. As a result, some cost overruns are distributed as a sort of "tax" on sales, or in other words, for every $50,000 overage in the legal department, the organization must sell an additional $1,000,000 of product above forecast. And since there are incremental costs associated with additional sales, and in some cases revenue cannot be fully recognized immediately, the actual surcharge is something on the order of $2,000,000. Think about that for a moment. Imagine the GC addressing her peers in the boardroom in late Q3 of the fiscal year. She claims that because legal matters are so uncertain there's no way to submit a proper forecast, and as it turns out she'll need an additional $50,000 in her budget, maybe more, and so Sales must step up and deliver an additional $2,000,000 in revenue. Someone's going to be eating alone in the executive cafeteria. Of course this applies to legal matters that start out small but grow into big hairy complicated messes. If the outside counsel doesn't provide early warning that the matter is growing beyond the expected scope, the GC can't properly re-assess the situation. Since legal matters are, at heart, business issues, it's critical to inform business management how new developments impact expectations. Does the discovery of a smoking gun during document review warrant a fast reversal of course in the SEC investigation? Will previously unknown IP infringement claims that surface in acquisition due diligence alter the calculus in a make vs. buy decision? The earlier a GC knows of the potential issues, the better she can advise business management. This is not to say outside counsel routinely and purposely withhold information, not at all. But when project scope is ill-defined in advance it sometimes takes too long to understand when the scope has materially changed, and this lag time is unacceptable. For help on defining scope, look into Legal Project Management. As with many of my life lessons, I learned the hard way. I vividly recall a product development project for which I was an executive sponsor. Each month for nearly two years the development team provided progress updates, sought additional funding, looked for guidance on feature/function decisions and otherwise adhered to the development schedule. However, two months before launch, long after we had incorporated significant new revenue streams into our current year forecast, the development team advised that they were six to eight months off schedule. They had hoped to make up time and they didn't want to deliver bad news, so they hadn't raised the alarm earlier, but other projects interfered and now there was no way to meet the deadline. As executive sponsor I wasn't necessarily expected to be sitting with the developers each day, looking over their code and analyzing their progress, but I was expected to know if the launch date would be delayed into the next fiscal year, putting all of our revenue projections at significant risk! I ate lunch alone quite a bit that year. Let's close with an unrelated anecdote. Because of my heavy travel schedule, much of it at hours when others in my time zone are fast asleep, from time to time I hire a car service to take me to and from the airport. I grew fond of one car service owner-operator and hired him exclusively for several years. Needless to say, I was a lucrative client for his small business. For one return trip I had a tight schedule: land at the airport, dash to the car waiting at the curb, try to shave off some time on the hour-long ride to my home, and make it to my daughter's band concert a few minutes late. There was no room for error, such as an unanticipated (but quite common) traffic jam, so I also consulted the train schedule. I could take a train and almost certainly have no delays, but I would miss more than half the concert. I gambled on the car service. When I left the plane, I called the driver to alert him that I was walking to the airport exit. He said he was slowly circling the airport, as is his custom so he doesn't have to park. The flight was long so I needed to visit the restroom and it was maybe 20 degrees (F) outside, but instead I waited outside for 10 minutes knowing the airport police would shoo away the driver if he approached and I wasn't there. After a few minutes I called back, and the driver revealed he was actually pulling into the airport now and would be there momentarily. Another ten minute delay. I called again and as the driver was telling me that he drove by but didn't see me, I heard a toll booth agent in the background. The driver then sheepishly admitted that he was just exiting the nearby interstate highway, and now he really was about 10 minutes away. You know how this ends, don't you? By now I had missed my train. There was no way I would see even a moment of my daughter's concert. I had been standing in below-freezing weather for nearly half an hour expecting the driver to arrive at any second, and, not to put too fine a point on it, I was in dire need of a visit to the restroom. So I told the driver I would no longer need his services, then I went inside, visited the restroom, bought a Starbucks and headed to the next train. A week later the small business owner sent me a letter scolding me for throwing away our cozy relationship merely because he was a little late. And, by the way, he claimed I owed him for the trip since I didn't cancel in time. The real error was not giving me the information I needed. I could have visited the rest room, secured a hot beverage and stood inside the door. I could've taken the train -- and I still would've paid the driver for his time. In other words, I could have explored my options. Instead, his misguided effort to protect me from the truth eliminated all of my options, leaving me furious, cold and in search of a new business partner. I'm presently conducting several client satisfaction interviews for law firm clients. Often we hear about poor communication and poor budgeting skills. Sometimes my Biglaw partner clients will dismiss these as one-time easily-explained situations that are blown out of proportion, certainly not the sort of issue to derail a longtime relationship. I caution them to put themselves in their client's shoes. Are these the comfortable loafers of a well-informed client? Or are these shoes hopping from one foot to another, trying to stay warm in the absence of information?